Summary: A quiet observation of the triumphs and defeats of daily life, along with the poetry evident in its smallest details. Film director Jim Jarmusch’s work isn’t everybody’s cup of tea. His films are often described by the average cinema goer as ‘hard to get’ and you can always guarantee that his films are going to make you think. His last film, Only Lovers Left Alive, may have been a vampire movie… but even that was a flick with a difference. Now comes one of Jarmusch’s most cinema-friendly films, Paterson… but even this is going to have to you thinking deeply long after you leave the cinema. Paterson tells a simple tale. It follows the lives of Paterson (Adam Driver – Star Wars: The Force Awakens), a poet who spends his days working as a bus driver, and his partner Laura (Golshifteh Farahani – Body Of Lies) who dreams drift from being a cup-cake mogul to starting a country music career. Ironically they live in Paterson, New Jersey and for the most part, the film follows Paterson’s regular day of going to work, listening to his passenger’s conversations, writing poetry, walking his dog and visiting his local bar. As you can ascertain from the film’s synopsis Paterson is one of those films where very little happens plot-wise yet while you are watching the movie you never find yourself getting bored. Jarmusch is a talented enough storyteller to know that you can get away with very little plot if you fill your film with enough interesting characters to hold your audience’s interest. Here, Jarmusch does that in bucket loads. While his life may be a little boring Paterson himself is a character that you find yourself rooting for because he is such a nice character and completely unaware of what a great poet he is. The secondary source of interest for the audience in Paterson is the interesting characters that Jarmusch chooses to have interact with Paterson. Whether it be passengers such as two men who know nothing about women, teenage anarchists or those that chat to Paterson in his local bar – a barman obsessed with celebrities who lived in Paterson, Doc (Barry Shabaka Henley – Collateral) or Everett (William Jackson Harper – True Story) and Marie (Chasten Harmon – Elementary) a young couple in disarray, these characters each bring something unique to the story at hand. Part of what makes Paterson such an interesting film is you never really know what Jarmusch is setting his audience up for. Is he planning on giving Paterson that one moment when he meets the right person who can help launch his career as a poet or even deliver the time when he finally realises that he does, in fact, have a talent that the world deserves to hear. Then, of course, the darker side of your imagination wonders whether or not Jarmusch is planning on putting his characters through something traumatic that will change their lives forever. Jarmusch’s writing also allows for some decent performances from his leads. Fans of Adam Driver will quickly tell you that he is capable of more than what we saw in his recent performance in The Force Awakens. 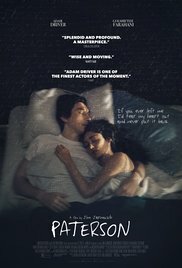 Serious movie fans will know that over the years Driver has delivered some powerful performances in serious films like What If, Midnight Special and Inside Llewyn Davis, and once again he delivers the goods here as he portrays the very melancholy Paterson. This film also introduces most fans to a bright, new star in Golshifteh Farahani. This fresh face shows pure talent as she plays the free-spirited Laura and you get a real feeling that she is somebody that we are going to see a lot of in the near future. If you go into Paterson expecting a high-octane film, then you will be sorely disappointed. Instead, once again Jim Jarmusch has created an interesting film that is largely a character study of two everyday people. This is a film that will have you debating what Jarmusch is trying to say with the film and will also have you seeing Adam Driver as a potential Oscar nominee.